The Cleveland Browns and New York Giants agreed to terms of a megadeal on Friday ahead of the expected free agency blitz next week as the Giants agreed to ship edge defender Olivier Vernon to the Browns for guard Kevin Zeitler. The teams will also swap Day 3 draft picks as New York will receive Cleveland’s fifth-round pick (155 overall) in exchange for New York’s fourth-round selection (132 overall), per Ian Rapoport and Mike Garafolo. Vernon heads to Cleveland fresh on the heels of a career year in overall grade while Zeitler was a key component in the late-year success for Baker Mayfield last season. With the dichotomous nature of football, there is a winner and a loser, and while people want to apply that same logic to trades around the league, the fact of the matter is both the Giants and the Browns won today’s trade. 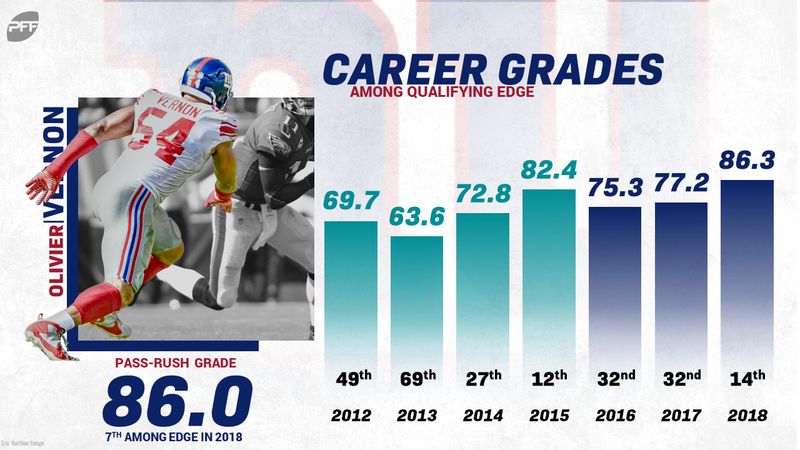 When Olivier Vernon inked a 5-year, $85 million deal back in 2016, he was never going to live up to the expectations that deal set. Vernon is simply not the type of pass rusher that racks up big sack numbers. That doesn’t mean, however, that the edge rusher was a bad player or even not worth the money in New York; Vernon’s 192 pressures over the last three seasons were the 16th most in the NFL. That’s despite missing a handful of games over that span with injury. Yes, it came on a top-dollar contract, but that’s top-notch production. Amid a rebuild though, the Giants had no reason to keep doling out top-dollar on a team that’s a few years away from competing. For the Browns, this was a no-brainer. Emmanuel Ogbah racked up a measly 31 pressures across from Myles Garrett last season – 15 of which were either unblocked or deemed a cleanup. On the other hand, Vernon had 46 on 82 fewer pass-rushing snaps. It comes with very little cost to the Browns with 2018 second round pick Austin Corbett waiting in the wings. It’s great to have a competent backup, but any difference between Corbett and Kevin Zeitler at guard is likely nowhere near the difference between Ogbah and Vernon. The same can’t be said about the difference between whatever the Giants were planning on throwing out at right guard compared to Zeitler. Patrick Omameh and Jamon Brown combined to allow 39 pressures in only 14 games last year. Zeitler, on the other hand, allowed all of 11 pressures all season long, and he owned the highest pass-blocking grade of any offensive lineman in the NFL. Every single quarterback in recent years who has hit the ground running when entering the NFL has done so behind a solid offensive line. This goes a long way towards giving New York just that for whenever they decide to find Eli Manning’s potential replacement. It’s not often that a trade makes so much sense for both sides, but there’s really no downside here for either team. Yes, the Giants’ pass rush takes a hit and the Browns’ offensive line will likely as well. But with the direction of both franchises are heading, the future outlook of both has greatly improved.